Growing up we didn’t have a Macy’s near where we lived. If we had, I’m sure that I would have loved taking my letter to Santa and mailing it to him in the big red mailboxes they have each year. Writing a letter to Santa was a big deal in and of itself. It represented all your seasonal dreams and was one of the few chances you had to communicate with the Big Guy. If there had been the opportunity to follow that up by delivering your letter in such a special way, that would have been the icing on the cake. We do have a Macy’s here in Louisville so this year I put together a plan in my head. First we’d visit Santa, then we’d write him a letter and drop it off at Macy’s, and we’d follow it up with a phone call from Santa on Christmas Eve. Layer the excitement little by little and help make the season really magical. 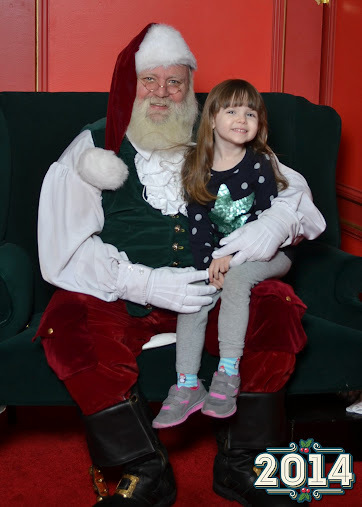 We checked the visit to Santa off while my family visited over Thanksgiving. Then a few days ago we sat down to write out her letter. She’s been really practicing her letters so I was able to spell a few words out for her to write on her own, and then she signed it. Dropping our letter off at Macy’s isn’t just about sending her wish list off to Santa. It’s also about granting the wishes of others. Because for every letter to Santa “mailed” at Macy’s (or submitted online) Macy’s is making a donation to Make-A-Wish. This past Friday was the National Believe Day. Here in Louisville one special young lady named Megan – who is 12 and has cystic fibrosis – had her wish to be a mermaid fulfilled. She was presented with a mermaid tail and it was revealed to her that she was headed to Atlantis Paradise Island where she can bask in the sun and practice her mermaid skills. In San Francisco’s Greater Bay Area there is a 4-year-old girl named Joysee who spent much of her toddler life receiving several rounds of treatment for leukemia (she’s in remission now, thankfully!). Her one true wish? A princess party with pink and purple decorations, a costumed princess, and cake and ice cream. She’ll be receiving her wish in January, but she had a special surprise warm-up celebration at the San Francisco Union Square location. All around the country these special wishes are being granted. And part of it is simply through people like you and I submitting a letter to Santa and having Macy’s make donations. If that’s not a reason to stand up this year and say “I Believe!” then I don’t know what is. Will you say “I Believe!” and send Santa a letter?